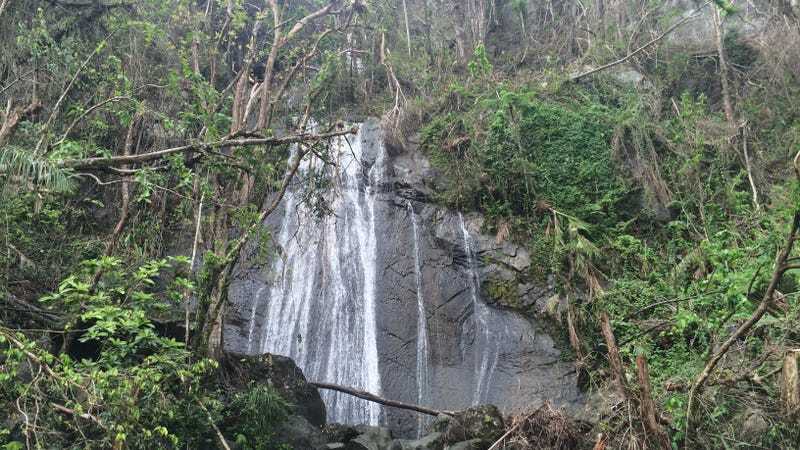 Puerto Rico’s El Yunque National Forest—the only rainforest in the U.S. National Forest Network—took a beating from Hurricane Maria. The photos that emerged after the storm, of downed trees, defoliated canopies, and battered infrastructure, painted a bleak, almost apocalyptic picture. But scientists expected the forest to bounce back, and eight weeks later, that appears to be exactly what’s happening. González would know—she’s been participating in surveys of the mountainous, 30,000-acre rainforest since shortly after Maria made landfall as a powerful Category 4 storm on September 20th. Winds in excess of 140 mph thrashed the trees, causing canopies to lose all of their leaves. Heavy rainfall both during and after Maria triggered a spate of landslides, rendering many roads impassable. But the truth is that El Yunque is well-adapted to powerful hurricanes—it has seen them before, after all. And while the canopies are still very open and bare compared with what’s typical, many trees survived. El Yunque’s famous palms, a dominant understory species at mid-elevations, are even starting to put out new leaves. “Even though some are severely damaged and mortality may be high, many are still standing,” Alan Covich, an aquatic ecologist at the University of Georgia who conducts research through El Yunque’s Long Term Ecological Research Experiment (LTER), told Earther. Like all ecosystems in wake of a natural disaster, the rainforest will now go through a process of succession, with pioneer species taking root first. “What’s going to start coming up now is ferns, grasses; pioneer species that can withstand these conditions of high light, high temperature,” González said, explaining that in addition to conducting tree mortality assessments, the Forest Service will be monitoring the successional process at research plots across the forest. “You’re going to see a slew of scientific analyses document [the impacts of] this hurricane like no hurricane before,” Lugo said. It could be six months, a year, or five years before the forest is back to how it looked before Maria. In some areas, like El Yunque’s slower-growing, high elevation dwarf forests, recovery could take decades. But even after the forest is back to looking like its old self, the floral and faunal make up could be markedly different, as new species take hold and become dominant. That includes the soil decomposers—insects, microorganisms, and fungi that are currently chowing their way through the pulse of fresh foliage brought down by Maria—all the way up to macrofauna like Puerto Rico’s famous, highly-endangered parrots, which face an uncertain future. González says the Forest Service is in the process of obtaining satellite imagery to determine what areas of the forest were hardest hit, including where landslides occurred. The most comparable hurricane in recent memory—Hugo, which struck the island as a Category 4 in 1989—produced more than 200 landslides across the Luquillo mountains, according to González. “In this event, there’s a lot too,” González said. “They’re all over and all sizes.” Landscapes that were impacted by landslides “will take much longer to recover,” she added. The Forest Service is also busy opening roads and water intakes to provide fresh water to nearby communities. With hundreds of thousands of Puerto Ricans still lacking a reliable water source, many have turned to the forest for drinking, bathing, and even washing their clothes. To González, who has been working with limited generator power since the hurricane, seeing people turn back to the forest as a resource, and witnessing the first signs of ecological recovery, have offered glimmers of hope. “It really helps the psyche,” she said. “That’s what the tropics is all about,” he added.